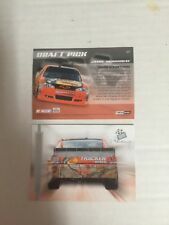 2011 Press Pass Burning Rubber Chase Edition of Jamie McMurray #109 / 150. Condition is Good. Shipped with USPS First Class Package. This card is from 2011 Press Pass FanFare Racing. This card is numbered 07/25. 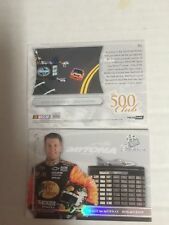 2011 Press Pass Premium Hot Threads of Jamie McMurray HT-JM #32 150. Condition is Very Good. Shipped with USPS First Class Package. 2011 Press Pass Premium Hot Threads of Jamie McMurray HT-JM #47 / 99. 2011 Press Pass Premium Hot Threads of Jamie McMurray HT-JM #47 / 99.. Condition is Very Good. Shipped with USPS First Class Package. 2011 Press Pass Burning Rubber Chase Edition of Jamie McMurray #14 / 50. Condition is Good. Shipped with USPS First Class Package. ^2011 Showcase GREEN PARALLEL #21 Jamie McMurray BV$10! #02/25! VERY SCARCE! I also have over 5,000 cards serial numbered to 25 or less, and another 10-15 THOUSAND numbered to 100 or less. The FRONT of the card is shown in the FIRST scan. (As you can see from the pictures, I have 28 different of these 60 scarce numbered to only/25 cards. ). 2011 Press Pass BLUE RETAIL #157 Jamie McMurray BV$4! SCARCE!!!!! You will not be disappointed! I have TONS of various cards from 1988 to the present, and there is no way I can submit them all! JAMIE MCMURRAY. Contest Card. 2011 Press Pass. ( As Pictured ). ^2011 Eclipse PURPLE PARALLEL #22 Jamie McMurray BV$7.50! #16/25! VERY SCARCE! I also have over 5,000 cards serial numbered to 25 or less, and another 10-15 THOUSAND numbered to 100 or less. NEW--revised, LOWER prices on over a THOUSAND race-used cards! The FRONT of the card is shown in the FIRST scan. ^2011 Press Pass CUP CHASE #CCR16 Jamie McMurray BV$4!! VERY SCARCE! Starting out with submitting a TON of serial numbered cards, many VERY low quantities. I have TONS of various cards from 1988 to the present, and there is no way I can submit them all! This is ONLY for the SINGLE CARD listed in the title above, identified in the grid above with an asterisk ( ), IN THE FIRST SCAN ONLY. ^2011 Eclipse PURPLE PARALLEL #54 Jamie McMurray BV$7.50! #19/25! VERY SCARCE! ^2011 Element PURPLE PARALLEL #23 Jamie McMurray BV$7.50! #25/25! SCARCE! I also have over 5,000 cards serial numbered to 25 or less, and another 10-15 THOUSAND numbered to 100 or less. The FRONT of the card is shown in the FIRST scan. (As you can see from the pictures, I have 57 different of these 100 scarce numbered to only/25 cards. ). ^2011 Press Pass BLUE HOBBY PARALLEL #157 Jamie McMurray BV$10! #09/10! I also have over 5,000 cards serial numbered to 25 or less, and another 10-15 THOUSAND numbered to 100 or less. NEW--revised, LOWER prices on over a THOUSAND race-used cards! You will not be disappointed! 2011 Premium PURPLE PARALLEL #69 Jamie McMurray's Car BV$2.40! #09/25! SCARCE! I also have over 5,000 cards serial numbered to 25 or less, and another 10-15 THOUSAND numbered to 100 or less. (This is one of 35 I have of these 90 scarce Purple Parallels numbered only to 25! Great way to start on a hard to find set!). JAMIE MCMURRAY. CHASE EDITION. BURNING RUBBER. COCA-COLA 600 WINNER. PRESS PASS. 2011 Showcase GOLD PARALLEL #56 McMurray/PabloMontoya BV$6.25! #035/125! Lower Left Lower Middle Lower Right. Upper Left Upper Middle Upper Right. 2011 Showcase GOLD PARALLEL #21 Jamie McMurray BV$6.25! #040/125! Lower Left Lower Middle Lower Right. You will not be disappointed! 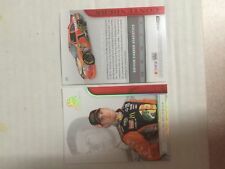 2011 FanFare SILVER PARALLEL #26 Jamie McMurray BV$6! #18/25! SUPER SCARCE! I also have over 5,000 cards serial numbered to 25 or less, and another 10-15 THOUSAND numbered to 100 or less. (This is one of 36 I have of these 100 scarce SILVER Parallels numbered only to 25! Great way to start on a hard to find set!). 2011 Press Pass PURPLE PARALLEL #24 Jamie McMurray BV$7.50! #19/25! SCARCE! I also have over 5,000 cards serial numbered to 25 or less, and another 10-15 THOUSAND numbered to 100 or less. (This is one of 51 I have of these 67 scarce PURPLE Parallels numbered only to 25! Great way to start on a hard to find set!). 2011 Premium PURPLE PARALLEL #25 Jamie McMurray BV$6! #05/25! SCARCE! Player: Jamie McMurray. Driver: Jamie McMurray. Card Manufacturer: Press Pass. Manufacturer: Press Pass. Card Attributes: Piece of Authentic Serial Numbered. Pictures are scans of the exact card you will receive. Player: Jamie McMurray. Set: 2011 Press Pass Stealth Holofoil. Manufacturer: Press Pass Inc. Year: 2011.